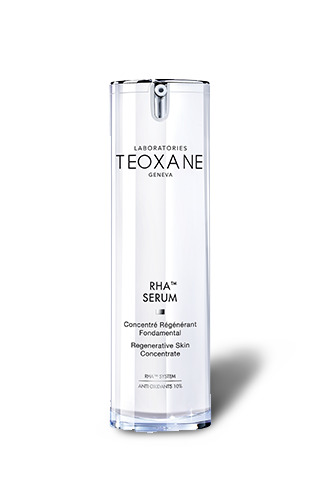 Innovation of cosmetic medical research laboratories of TEOXANE. Highly dosed RHATM that helps reactivate the natural mechanisms of deep skin regeneration: cell renewal, tissue restructuring. Action combined with enhanced antioxidant protection. Texture second high hydration to the skin tightening effect. RESULTS: From 14 days, the traits d�fatiguent. Smoother, the skin regains its ability to reflection of light, the complexion is brighter. * The skin is plumper and more toned. " * Assessment conducted on 31 volunteers by ind�pendantl-profit laboratory after 28 days. Apply 2 or 3 doses on the face and neck, morning and evening before TEOXANE care protocol. RHATM SERUM can also be used in the context of professional aesthetic procedures: ask your practitioner. External use. Formula INCI: Aqua (vvater) Diglycerin, propanediol, glycerin, phosphate buffered sauna, Imperata cylindrica root extract, hydroxyethyl acrylatejsodium acryloyl dimethyl taurate copolymer, sodium polyacrylate starch, pentylene glycol, sodium hyaluronate, chlorphenesin, parfum (fragrance), Tamarindus indica extract, ppg-26-buteth-26, peg-40 hydrogenated castor oil, sodium hyaluronate crosspolymer-2, disodium phosphate acetyl glucosamine, glyceryl acrylate / acryuc acid copolymer, polysorbate 60, sorbitan isostearate, caprylyl glycol, carbomer, phenethyl alcohol, plankton extract, sodium citrate, methyusothiazolinone, acrylates / C10-30 alkyl acrylate crosspolymer, citric acid, biot1n, glutathione, pyridoxine hcl, thioctic acid, acetyl cysteine, lysine hydrochloride, vaune, isoleucine, leucine, threonine, arginine, glycine, zinc acetate, proune, copper sulfate.